Andrea Shea King published Obama sending Muslims subtle message? on Joseph Farah’s World Net Daily (WND) about a photo of Pres. 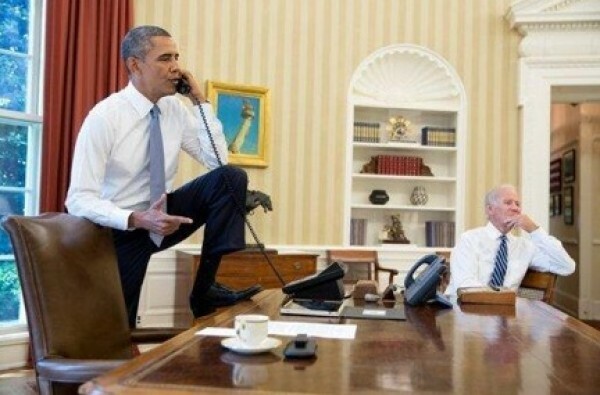 Obama with his foot on the desk in the oval office. This is not exactly big news since The Blaze has photos of Ford and Bush with their feet on the same desk here. They published this after some people called Obama’s foot on the desk “disrespectful”. Considering that WND thinks Chuck Norris qualifies as a Sharia expert, nothing coming from them should be a surprise. I can’t tell from this photo if Obama is wearing his “Muslim Ring”, or holding his hand in a “special way” that actually sends a secret Muslim message, or whether he is talking on the phone in his secret Muslim code language [all of these are previous claims made by Islamophobes including WND]. But, I do know that I would need a secret decoder ring or some other advanced super powers to detect any messages Obama is sending to anyone in this photo, or with secret hand signals, or secret language codes. I have not received any such decoder, no hand signal manual, no dictionary of secret Muslim language codes, nothing — nor has any Muslim that I know. The Islamophobia Echo Chamber of which World Net Daily is a part are promoting total fantasies and paranoid conspiracy theories with no basis in fact. These individuals and organizations consistently promote the false what everyone “knows” lies about Islam and Muslims (including distorting the meaning of Qur’anic verses, and distorting the meaning of Islamic terms such as taqiyya, jihad, sharia, etc.). Islamophobes falsely claim to see “JIHAD” PLOTS everywhere, particularly where they don’t exist. They, like Muslim extremists, don’t understand the true meaning of the term jihad. The Islamophobes have uncovered countless examples of “shocking”, non-existent Muslim jihad plots. The Islamophobes have uncovered countless examples of “shocking” Muslim jihad plots. Islamophobes do not understand freedom of speech or that freedom of speech does not include freedom from condemnation of that speech and they are quick to call for censorship and repression of speech they don’t like.